At last year's Toy Fair we saw the first hint that Activision had been tapped by Nickelodeon to develop new TMNT video games. Now, on the eve of this year's Toy Fair, we have confirmation of that deal and the first hints of what we can expect. Nickelodeon and Activision Publishing, Inc., a wholly owned subsidiary of Activision Blizzard, Inc., today announced a worldwide, multi-year deal to develop and publish video games inspired by the new CG-animated series Teenage Mutant Ninja Turtles. Under the new agreement, Activision has the global rights to produce interactive games based on the Teenage Mutant Ninja Turtles property. Multiple sites are claiming that the first of three titles is due to come out this summer, although no supporting information or sources are cited. Watch here for more details as they're made available! Among the new photos from Toy Fair posted yesterday by ToyArk.com was the above photo of a sign hanging in the booth. 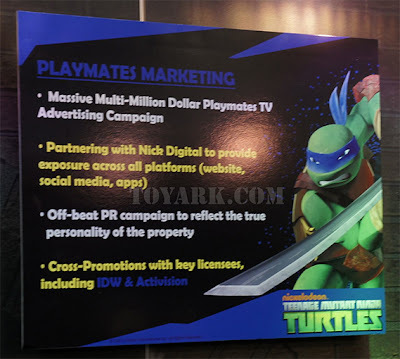 This sign indicates that key licensees working with Nickelodeon on the TMNT property are IDW and Activision. 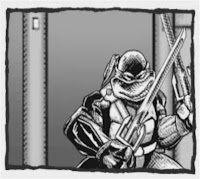 IDW, of course, is publishing a slew of TMNT comic book titles, both new and old. 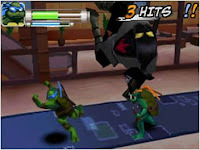 Activision, however, has not officially been connected to the TMNT property. 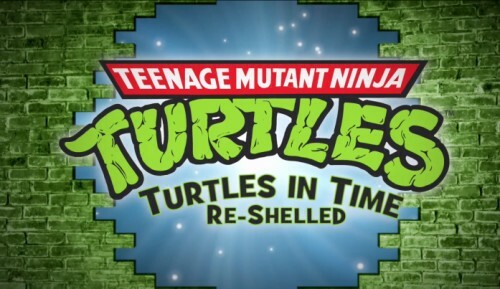 While it is not a surprise to see Activision, who is partnered with Nickelodeon to turn many of their series into video games, connected to the TMNT, this is the first sign we've seen that something may already be in the works. 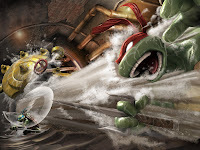 Ubisoft had previously held the TMNT license until losing it last June. Joystiq.com is reporting that TMNT Turtles in Time Re-Shelled will no longer be available after June 30, due apparently to Ubisoft's TMNT license expiring. Turtles in Time Re-Shelled is, of course, the X-Box Live Arcade and Playstation Network updated version of the classic arcade and SNES game. Obviously, if you have not yet purchased the game and you wish to, you should do so now without delay. 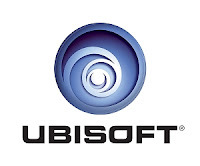 However, it is also interesting to note the expiration of Ubisoft's license. Does this take them off the table for any upcoming games related to Nickelodeon's new CGI series, or the eventual movie from Paramount? I guess we'll just have to wait and see. Thanks to Harris for the tip! Today's Gold Box Deal of the Day over at Amazon.com is TMNT Smash-Up for the Wii, for the low price of $29.98. The regular Amazon price is $46.99, and the MSRP is $49.99, so this is a deal you don't want to miss if you've been holding out on this title. This deal will expire at the end of today, so don't wait! Obviously, questions are flying furiously since yesterday's out-of-the-blue announcement that Peter Laird has sold the entirety of the TMNT property to Nickelodeon/Viacom. I've managed to track down a few answers that may help provide some insight on what's about to happen. Peter Laird - Co-creator of the TMNT, who allowed this sale to happen. Jim Lawson - Long-time and beloved TMNT comic book artist. Jake Black - Freelance Tales of the TMNT writer and source of inspiration for several fund raising efforts this year. 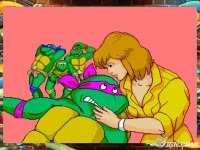 Some fans have noticed that certain parts of NinjaTurtles.com have disappeared, among them the catalog through which you could buy stuff directly from Mirage. Dan Berger reports, "We'll be starting a new web site soon where we're selling all the stuff we used to have posted." Concerning the future of TMNT comic books, as Peter alludes to in his blog, some rights to publish comic books have been maintained. Dan was able to clarify that "Peter maintains the right to publish up to 18 TMNT comics per year that can be sold via the direct market and/or web site." To further clarify this, Dan states that Tales of the TMNT Vol. 2 will continue through to and conclude with issue #70, scheduled for next year. TMNT Vol. 4 will continue at a pace that only Peter Laird will be able to decide. Beyond that, they are (likely) allowed to do reprints, so long as they are between 32-48 pages, which rules out the publication of any trade paperbacks. The inability to publish TBPs is why the "Mirage Universe" book, which had been scheduled for a December release, has now been canceled (as reported via Jake Black on Twitter and Facebook this morning). When asked about "The Forever War" being published, Dan wasn't optimistic about its release, but added, "That's Murph's project." When asked, Steve Murphy's answer was, "I'm not sure." While the TMNT have been sold lock, stock, and barrel to Nickelodeon/Viacom, Peter Laird stresses that he did not sell Mirage Studios. As Jim Lawson reported, Peter will continue to allow the artists to use their studio space, should they wish to. However, they would do so independently and not as Mirage Studios employees. Dan states, "Mirage as an employer ends on December 31 of this year," then ads, "but the regular crew will be here at least 'til May as independent contractors." Dan himself forsees sticking around through at least the end of 2010. Moving to the future as Nickelodeon has it planned, very little is known. There have been some unspecific reports that they already plan to head in a direction along the lines of the original 1980s cartoon. However, this has not been verified (and who knows if Nickelodeon is even 100% sure about which direction they'll be taking). As for what happens with the current licensing deals already in place, a representative at Nickelodeon has stated to GamePro, "We plan on fulfilling all current obligations." This would apply to the current toy contract with Playmates Toys, as well as the video game contract with Ubisoft, among others. The biggest unknown at the moment remains the fate of the planned movie. While a movie has been announced to be released in 2012, it is not known if this will be the same movie that had previously been on track for 2011 or if Nickelodeon will wipe the whole slate clean and begin anew. And if they do that, what direction will they take it? That is a question that remains unanswered for now. 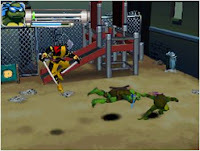 No, this isn't a breaking news flash, but Ubisoft has recently (and officially) announced the upcoming release of "TMNT: Arcade Attack" on the Nintendo DS, scheduled for later this fall. And Ubisoft has been kind enough to send along the following art and screen shots. Thanks, Ubisoft! Here's something that got a little lost in the chaos surrounding Comic-Con. And since it's not exactly new anymore, anyone following the latest news on this game has probably already found all of this, but here's another video and screen shot collection provided by Ubisoft. Hey, I must be on "The List" now - Ubisoft has checked in again, this time with new screen shots and a video revealing three new playable characters: Karai, Nightwatcher, and Fugitoid. Check out the pics & video below. You probably know about the upcoming TMNT Smash-Up & Turtles in Time: Re-Shelled video games, but aside from breaking the news on the existance of TMNT Re-Shelled, I've pretty much left the gaming Web sites to take care of feeding the public with info on them, since they generally get fed all that information directly and the only thing I'd be able to do is steal their news from them and I'm just not that kind of person. Anywho, a fine gentleman from Ubisoft was kind enough to send me an e-mail with some pictures that, apparently, have not been sent to any of the other gaming Web sites (yet). That's right, these are for Turtles fans first! Update: Quality issues have been fixed (thanks, Ubisoft! ), but I'm told that this images aren't particularly new. Well, I guess it's still something. Available September 15 on Wii and September 22 on Playstation 2. 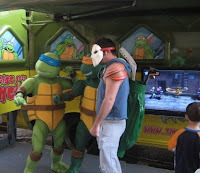 At last week's Galabunga events in NYC, the debut of the Turtles' Party Van also revealed that a "new" TMNT video game - not the already revealed "Smash-up" game for the Wii - was in development. New, yet a game all TMNT fans are familiar with: "Turtles in Time." Only now it's been updated using modern 3D graphics. Mega TMNT fan Jason Koza was at the event (in his Casey Jones costume!) and provides the following info and pics of the game. 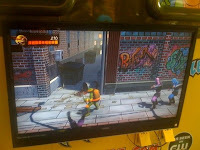 The game is set up and directly taken from TMNT Turtles in Time. Right now it's only going to be for Xbox Live, but they're working on bringing it to Wii (Virtual Console Wiiware?). It has the same music as the old game. Only the levels "Alleycat Blues" and "Skull and Crossbones" were playable. The only difference noticed was the bosses for the "Skull and Crossbones" are Tokka and Rahzar (unlike the original, which had Bebop and Rocksteady). For Alleycat Blues the boss is still Metalhead. The game is basically Turtles in Time with new graphics - Awesome! Actually, Tokka and Rahzar were the bosses on Skull & Crossbones in the ORIGINAL (Arcade) version. They were moved to the (added) Technodrome level for the home version, and replaced with Bebop & Rocksteady. This means the remake is probably based on the Arcade version, meaning no Technodrome level, no Rat King, etc. The first details of next year's TMNT video game from Ubisoft, revealed to be in development last year by Steve Murphy on The 5th Turtle, have started to emerge. There is a blurb in the new Nintendo Power and GoNintendo is reporting a few additional details from a producer at Ubisoft. Props go to StealthNinjaScyther, Tansut, and The Ninjinister on the Technodrome for finding the links. 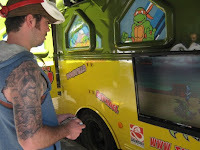 Konami's original TMNT arcade game from 1989 came in as 2007's top X-Box LIVE arcade titles in sales! Major Nelson has the report. Thanks to tOkKa for the heads-up! TMNT movie sequel: Mirage and its partners (Imagi, Warner Brothers and the Weinstein Group) are still discussing the possibility of a sequel for the CG film. Hopefully a decision will be made by the end of summer. Think positive - create good karma! TMNT cartoon on 4Kids TV (USA): Six new episodes of "Fast Forward" will air this fall beginning in September. From January to May of 2008, 4Kids TV will air most or all of the "Ninja Tribunal" episodes (although episode #110, "Nightmares Recycled", WILL NOT be completed or aired). 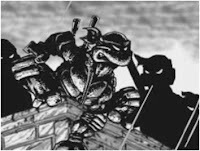 Series producer Lloyd Goldfine and TMNT co-creator/owner Peter Laird are currently in talks regarding a new direction for the series to take in the fall of '08, but no definite decision has been made regarding what this new direction may be. Time will tell - but mum's the word for now. Playmates Toys: movie-themed toys will continue to be released until mid 2008. No decisions have been made yet regarding what will be released for the second half of '08. Rumors of a 5' tall robotic action figure that can talk and do seven different martial arts moves are not true. Ubisoft: Mirage is in negotiations with Ubisoft to produce a new TMNT video game. The CG movie models will be used, although the game will be independently produced (so it won't be directly based on any preexisting media like a TV show or film). 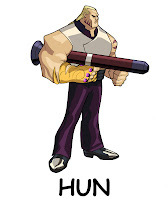 If all goes well, the game will be out in late 2008 or early 2009. More than likely it will not be released on all of the same platforms that the movie game appeared on. A retro-licensing program will kick into high gear in 2008 with merchandise based on the 1980s TMNT cartoon series. Lots of adult-sized gear will be available! Can we get a "Cowabunga!" from the faithful? Awe yeah! Steve Murphy will be spearheading (katana-heading?) special events and merchandise programs to commemorate the 25th anniversary of the TMNT comic book in May, 2009. It's too early to say what will be involved, but Mirage plans to celebrate this monumental achievement in style!